Festival Foods is a local supermarket chain here in Wisconsin. They market a cut of beef called a “Spoon Roast” that is basically a prime tri-tip loin cut. For this recipe, be sure to select a cut that is unseasoned – (Festival offers one called a burgundy pepper seasoned spoon roast.) We will add our own marinade, let it sit overnight and then slow smoke it for several hours over apple wood until the marinade forms a nice crusty glaze and the meat is fall-apart tender and super juicy. Serve with roasted carrots or asparagus and baby red potatoes on the side. Good eats!! Add the wet ingredients for the marinade in a mixing bowl and then add the dry spices. Whisk thoroughly for about three minutes so the brown sugar completely dissolves. Place the roast in a covered locking container and cover it completely with the marinade. Seal and rotate occasionally, leaving it to set overnight in your fridge. The next day – set your smoker at 225° F, and place two cups of apple juice in the drip pan. Remove the roast from the marinade and place in the smoker with a temperature probe in the thickest part of the meat. Smoke over apple wood for about 1 hour or until the internal temperature reaches no more than 140° F. Larger cuts of meat may take significantly longer. When done, remove and let stand in a covered roasting pan for 30 minutes until ready to serve. This will draw the juices back into the meat so it stays moist. Slice thinly and serve. I threw this together over the weekend and was impressed by how rich and decadent the wine sauce gravy turned out. Out of all of the pork loin recipes I’ve tried, this is one of my favorites. In order to achieve a proper roux, you need to be patient. The result is perfection. If you prefer fresh mushrooms, by all means, use them. Enjoy! Preheat oven to 275-degrees F.
Heat a large, heavy 5-qt cast-iron dutch oven over medium heat with the olive oil. Brown the roast on all sides and then set aside. Reduce the heat slightly, and deglaze the bottom of the pot with the red wine. Reduce heat to medium-low, then add the butter and the flour with the diced onion and stir constantly to form a dark roux; time varies but it may take over a half hour. Do not scorch the roux or it will taste bitter. Add the water, Kitchen Bouquet, chicken base, fresh celery and canned mushrooms with their juices. Stir to incorporate, then add the dry spices. Bring to a boil, stir and shut off the heat. Add the pork roast back to the pan with juices. Cover and bake in the oven for at least three hours; add the carrots during the last hour of cooking so they don’t get too soft. Serve with your choice of potato or wide egg noodles. There are literally hundreds of ways to prepare a roast – each one grounded in family tradition. I’ve always been inspired by the simplicity of preparation; a classic Sunday meal with roots in colonial America. Here is my version which is braised slow and low – I hope you enjoy it as much as I do. In a large plastic shaker bag, add the flour, paprika, garlic powder, 1 tsp. salt and the black pepper. Shake well to incorporate. Add the roast to the bag and shake to coat evenly. In a 5-quart cast-iron dutch oven set to medium, melt the 4 tbs. butter, but do not scorch. Reserve two tbs. of the seasoned flour from the shaker bag. Add the roast to the pot, increase the heat to medium-high, and brown evenly on all sides. Shut off the heat and remove the pot to an unheated burner. Remove the roast from the pot and reserve on a large, covered serving platter. It’s time to make a classic roux, which will be a base for the gravy. When the pot with the butter and drippings has cooled slightly, add the reserved flour and mix lightly to form a roux. Stir constantly over low heat for about 10 minutes. Preheat your oven to 275° F.
Mix the dry onion soup mix, Kitchen Bouquet, Worchestershire sauce and beef base in two cups boiling water and add to the pot. Add the fine-chopped celery and parsley, bay leaves and black pepper – mix well, then add the roast back to the pot, cover tightly and bake in the oven for at least three hours, until tender. Turn the roast over and add the carrots and potatoes during the last 1.5 hours of cooking. The carrots are more dense than the potatoes – therefore they will take longer to cook. You can compensate for this by nesting them in the gravy around the roast, and then place the potatoes on top. The roast should be fork-tender when done. Serve with the pot juices over the potatoes and carrots. Note: I’ve had fantastic results using a rump roast vs. a more expensive chuck roast. They also tend to be more lean. 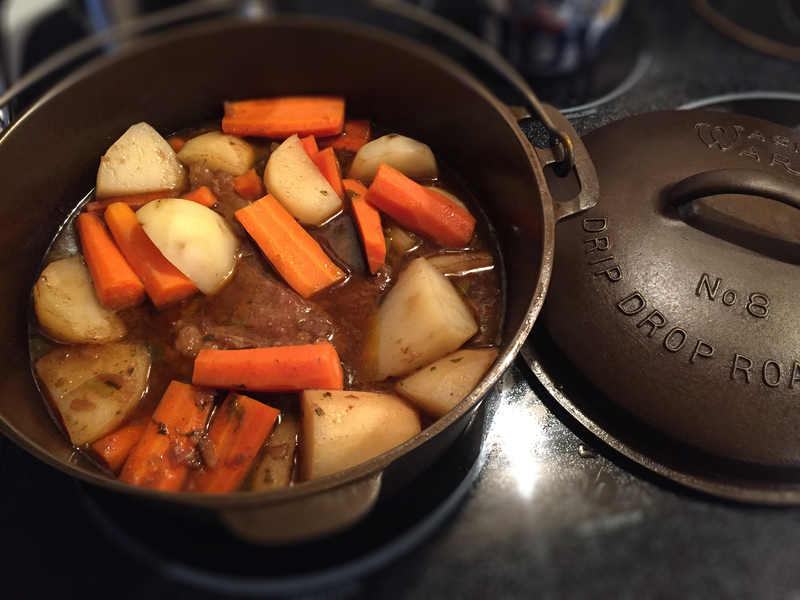 My Lodge® and antique Wagner Ware cast-iron dutch ovens are essential for the preparation of this meal. The basting spikes on the inside of the tight fitting cover ensure that the meat remains tender. The heavy iron guarantees even heating. This is a simple, savory recipe that tastes fantastic considering the minimal ingredients devoted to its preparation. The pork roast can be made in a dutch oven or slow cooker. With mashed potatoes on the side, there’s nothing better on a cold winter night. In a large, heavy 12″ cast-iron skillet, bring one tbs. of butter up to frying temperature and brown the roast lightly on all sides. Shut off the heat and set the roast aside. Preheat your oven to 240 degrees F.
In a five-quart cast-iron dutch oven, add the soup ingredients, water, spices and chicken base. Whisk to incorporate and then carefully add the browned roast. Cover tightly and cook for three hours, or until the meat is evenly done and starts to fall apart. When the meat is done, remove from the pot and reserve on a cutting board. Let stand for five minutes and then slice into 1/4″ pieces. Add the corn starch with one tbs. water in a small mixing bowl and mix to form a slurry. Add to the pot gravy and mix well. Bring the gravy up to a low simmer and cook until thickened to your liking. Add the pork back to the pot and serve with mashed potatoes. If you’ve never taken the time to slow roast beef on the grill over wood coals, you must try this recipe. The aromatic crust adds a great contrast to the perfectly roasted meat. Slow and low are key to success! Combine all of the dry rub ingredients and mix well. Cut 6 small, equally-spaced slits on each side of the roast with a sharp paring knife. 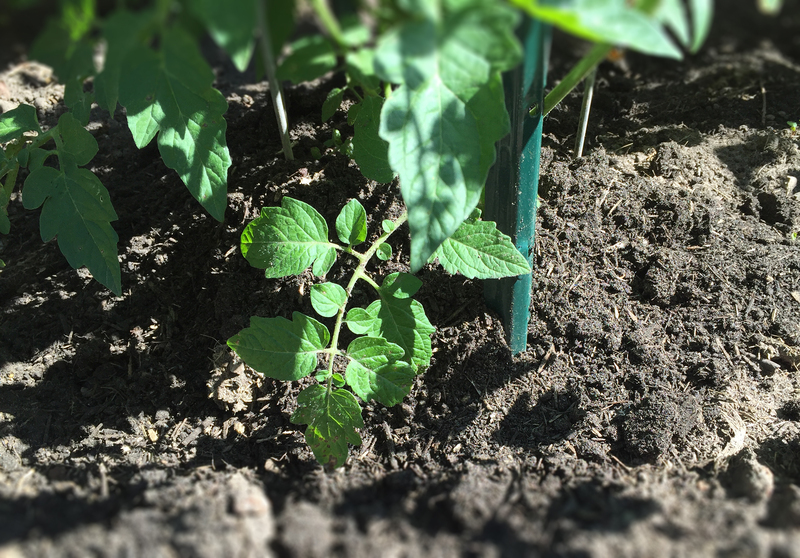 The slits should be only 1/8-1/4″ across. Insert the raw garlic into the slits, ensuring that the garlic closes the cut so juices don’t escape. Apply the dry rub ingredients thoroughly over the roast. Seal the roast in an airtight plastic bag and marinade overnight in your fridge. When ready to grill, soak 2 cups of hickory or mesquite wood chips in water for at least 1 hour. Prepare a rectangular drip tray of aluminum foil the size of the roast. Light a medium-sized pile of charcoal on the grill and wait until it turns white-hot. Divide the coals to the sides of the grill for indirect heating. Place the aluminum foil drip tray in the center on the coal rack. Place the roast on the grilling grate in the center (aligned with the drip tray) and cover, cooking for 1 to 1.5 hours, turning only once halfway through the cooking process. Stoke coals as needed to maintain a consistent, medium-low fire. Soaked wood chips may be added to the coals in batches – but take care not to lift the cover too often. Remove from grill, let stand in a covered warming tray for 10 minutes before slicing. A Colorado regional favorite. The New Mexico chilies add great depth and flavor to this dish. 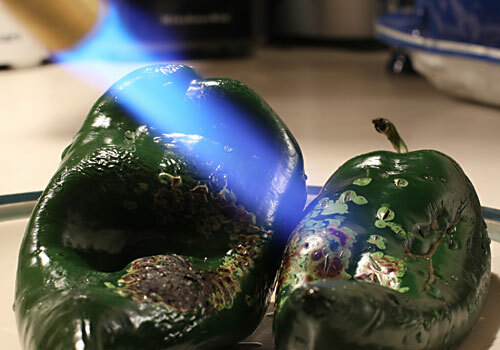 Place chiles and 3 cups water into a medium stockpot, and bring to a boil. Remove from heat and steep for 30 minutes to soften. Strain into a bowl, reserving the cooking liquid. Place the chiles and some of the liquid into a blender, and puree until smooth. Add more liquid as necessary to form a smooth sauce. Pass sauce through a fine mesh strainer to remove any seeds and the tough skins; set aside. Cut the roast into 1 to 2 inch chunks. In a medium bowl, combine flour, salt, and pepper. Dredge the beef chunks in the seasoned flour; set aside. Heat olive oil in a large pot over medium heat. Saute onion until tender and translucent, about 5 minutes. Add beef chunks a few at a time, so as not to overcrowd the pot, and cook until evenly brown. Remove cooked meat, and continue browning remaining meat. Return reserved cooked meat to the pot. Stir in pureed chile mixture. Add beef stock to just cover beef chunks, or to personal preference. Bring to a boil over medium heat. Reduce heat to lowest setting, and simmer for 3 hours, or until meat is tender. If necessary, adjust with more stock during cooking. Serve with chopped onion, sliced green onion, shredded cheddar cheese, and sour cream.